Jakarta – April 11th, 2013 – Archipelago International and PT. Belitung Permai Abadi celebrated the topping off of Belitung’s first international 4 star hotel and conference center, the Aston Belitung Hotel. 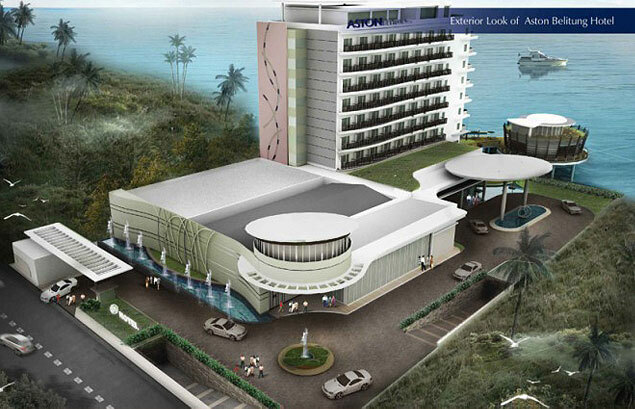 The Aston Belitung Hotel is will feature 174 superior and deluxe guest rooms and suites, a modern and multifunctional conference center with several meeting rooms, a coffee shop and lounge and recreational facilities including a full service spa & sauna, bar and swimming pool with ocean views and a well equipped gym. Belitung is an island off the coast of South East Sumatra and was one of the first tin mining centers in South East Asia giving name to the multinational mining giant BHP Belitung. Belitung has in recent years been recognized for its potential as an up and coming tourism destinations offering easy accessibility from Jakarta, Singapore and Palembang and some of the best tropical beaches in the region edging on turquoise calm seas and benefiting from a long dry season with sunny blue skies. 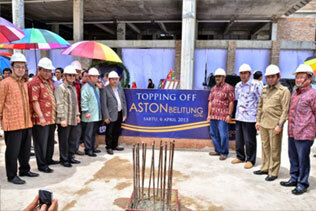 Snapshoot Topping Off Aston Belitung Hotel, seen in the image - Mr. Norbert Vas Vice President of Sales & Marketing Archipelago International, Mr. Hartono Widodo - owner of Aston Belitung Hotel, Mr. Budiono Widodo - President Commissioner of BW Group that also as owner of Aston Belitung Hotel, Mr. Sahani Saleh S.Sos - Vice Regent of Belitung, Mr. Rustam Effendi BA - Vice Governor of BangkaBelitung Island, Mr. Andi Saparrudin Lanna, SH - Head Parliamentary of Belitung, Mr. Sardjono Widodo - Owner of Aston Belitung Hotel.